Cold Steel Assegai Long Shaft Spear with Sheath | BUDK.com - Knives & Swords At The Lowest Prices! 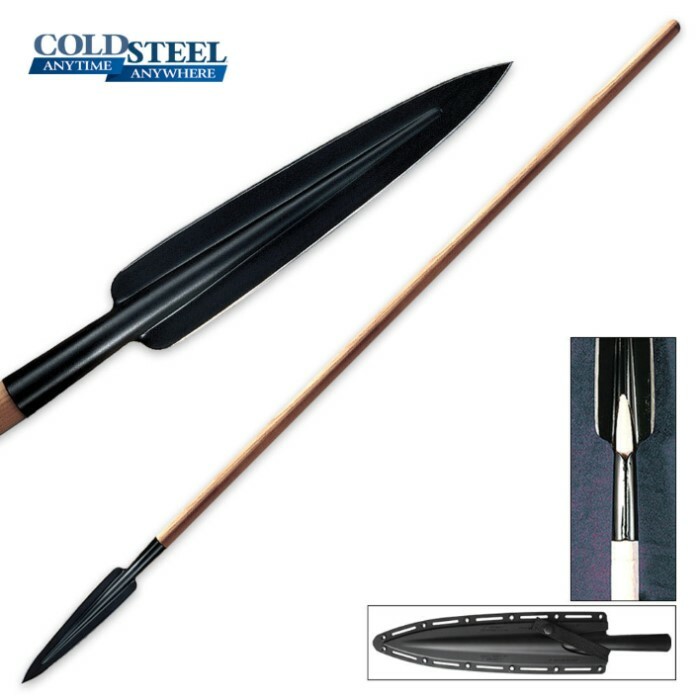 The Cold Steel Assegai spear is equipped with all the features the original Assegai spear had in the 1800s, making this one fierce spear! The spearhead is constructed of SK-5 carbon steel that has been heat-treated. The spearhead is able to bend rather than break, unlike other spears on the market today. The premium American Ash shaft is perfect for full-length throwing. Includes a Secure-Ex sheath. If you want a REAL spear, this is your chance. The carbon steel spear head is well built, sharpened, has a 13" cutting edge. With the sheath removed, the point of balance is 32" back from the tip. The shaft is quality wood, they even designed it properly so blows to the cutting edge are transferred to the end grain of the shaft. This thing is a joy to use, it spins effortlessly, highly recommend! The shaft alone is a serious threat, It's thick and heavy. Its weight also makes the spear hit very hard. The blade is large. large enough to use as a short sword if you wanted to. It came sharp, it has a hole to fasten it to the shaft. I am not putting a screw in there, but I might pin it. I want the blade to be removable-this thing is nearly 7 feet tall. Whatever you throw this at is going to die. This Review is for those who have knowledge of Spears. This Spear is a serious Weapon and should be handled with care. The two mounting bolts sent to attach the knife to the handle are inferior strength. (Best to Buy Stronger Screws) I would not trust them. I piloted the holes after making sure the head was tight on the shaft. There are a number of ways to secure the head to the shaft. Now this spear is NOT made to be thrown at a Tree, it is meant to be thrown at objects with soft entry. (Hay Bales for Practice) As far as Hunting is concerned, this is the spear to have. (Wild Hog Hunting) Do Be Careful and Happy Hunting. The Sheath for this Blade is a tight fit and it can be VERY Dangerous to extract. I filed the two ears inside where they catch the blade a little at a time so as not to make it too loose. Now I can extract Sheath SAFELY and more easily. Ready for my next hunt.